In truth there is nothing that be seen visually that cannot be painted. 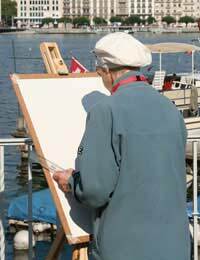 There are, however, some things you may wish to consider before choosing a subject to paint. There are a great many different approaches to take when painting, from a purely visual approach, to one that attempts to convey a message through symbols, to one that is very much message based and therefore considers that act of painting merely as a means to express another goal. Choosing a subject is dependent in this case on exactly what it is that you wish to express and for this reason you may wish to start by asking yourself whether you are someone concerned merely with conveying visual appearances, the specific attributes of ‘paint’ (painterly issues), expressing timeless narratives, emotions and perhaps even spirituality, or someone who thrives on conveying social and/or political messages. The chances are that this will be a relatively easy question to answer as it will reflect your general artistic preferences. If in doubt, look to those artists that you admire to ascertain hoe they might have approaches their subject matter, and how this affected their choice of subject matter. Of course, there are significant crossovers in the approaches you may take, and whilst being concerned with visual appearances, and with the specific properties of paint, you may also believe artworks to have an intrinsically social or political aspect. Equally, the ‘painterly’ element may converge with a more symbolic element, and so on. The key here is to hone your message to the bare bones in order to convey what you are trying to say clearly. No painting has ever suffered for its simplicity as such, but many have suffered for a lack of clarity. The clarity of a painting basically depends on its overall adherence to the central message that is being conveyed. If that message be on about colour, for example, then this as to be clear – the use of a political slogan of very thick paint will confuse the viewer as to what the central message is. Similarly a very directly political message will suffer for being highly coloured, or very thick in the application of paint. Put simply, the painting need be true to itself and choosing a subject entails the artist staying true to their intentions. In order to hone the message it is worth undertaking some sketch book preparation, gradually clarifying your approach as you go, whilst losing unnecessary elements. It is also well worth trying a number of subjects early on, before settling on that which best suits your intended outcome. When finally choosing a subject there are a number of things to consider, depending on what approach you wish to take. If concerned predominantly with painterly issues take into consideration the fact that the subject still remains important: You may well wish to refer to subjects covered by old masters, thereby making it easier to focus upon the properties of paint. If using symbols in your work take a look to the work of the Symbolists and Surrealists who used symbols to convey spiritual issues, emotions and dream narratives. Undertake research on symbols: Often symbols have many different meanings across different cultures, and sometimes this crossover of meaning can be beneficial, lending another aspect to the artwork. If wishing to approach a social or political issue first know your subject: The strength of the artwork will issue largely from the strength of knowledge behind the work. Naïve political statements will make for naïve artworks. Also take into account the view that the most directly political artworks are not always the best, and often cause people to turn away from them, as they often turn away from overly zealous and aggressive political campaigning. Subtlety may impact on the viewer in a much more profound way than visual aggression. In considering the above it is possible to choose a subject to paint from an informed rather than purely random perspective.